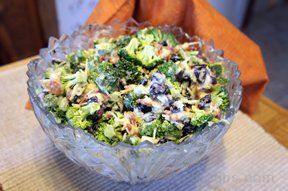 Perfect for serving with almost any entrée, this Broccoli Grape Salad Recipe features a delicious combination of flavors and pleasing textures. 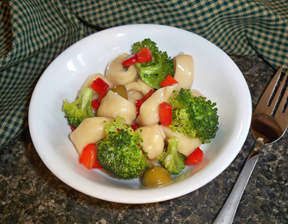 Learn about different types of broccoli in All About Broccoli and to serve it as a hot side dish see How to Ccook Broccoli. 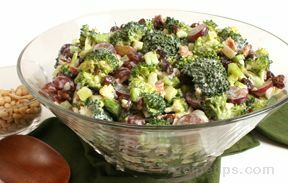 Place prepared broccoli, celery, onions, grapes, raisins, and crispy bacon into large mixing bowl. Pour dressing over broccoli mixture, stirring until combined. Cover and refrigerate for several hours to overnight allowing the blending of flavors. 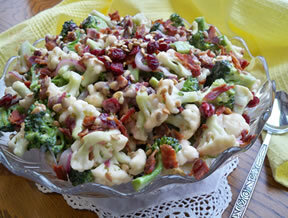 This salad doubles or triples easily to serve a crowd. Other salad ingredient addition recommendations: cauliflower, craisins, bacon bits, and minced sweet onion. Tiime Saving Tip: Buy pre-cut broccoli, celery, and onions, as well as pre-cooked bacon. "I loved this salad! I made some modifications based on my own taste and also what I had on hand. I used about 1/2 the bacon, shallots,raw sunflower seeds and raw almonds, about 1/4 cup craisins and apple cider vinegar. Next time I'll use a bit more milk and a little less mayo- the dressing was pretty thick. This was very popular and could have fed 8 people or more." "Yum! Love this salad! I used Miracle Whip and skipped the sugar - turned out delicious and cut about 500 calories less, so very healthy! Loved it and have been spreading the word :)"